There are a lot of ways to prepare carrots, some of which are more intense than others. The dip below comes together fairly easily and provides a nice robust carrot taste with just a hint of tang from the yogurt. It makes a great healthy appetizer or when served with pita makes a nice light lunch. This is my favorite dish to bring to summer picnics because it travels well, tastes great and it's good for me! When choosing carrots look for ones that are firm and smooth, avoid any that are cracked or limp as they won't taste as delicious. Carrots are a hardy vegetable that will keep a long time if properly stored. Inside a plastic bag and in the coolest part of your refrigerator is usually best. Both regular and Greek yogurt would work well in this recipe and both are nutritious and healthy. But if you’re looking to add more protein and fewer carbs to your diet, then Greek yogurt is the way to go. Garnishing with feta and olives provides a nice salty-sweet contrast, so be sure not to skimp. Coarsely grate the carrots. Heat olive oil in a skillet. Cook garlic until fragrant. Add grated carrots and cook until just softened (about 5-7 minutes). Remove from heat and set aside to cool. Meanwhile, add salt, and crushed red pepper to the yogurt and mix well. Add cooked carrot mixture and stir to combine. Garnish with chopped olives, crumbled feta and a little drizzle of extra-virgin olive oil. At first I thought this was a sweet dip like carrot cake dip - hmmm, definitely not, but I love the savory flavors! Yummy! 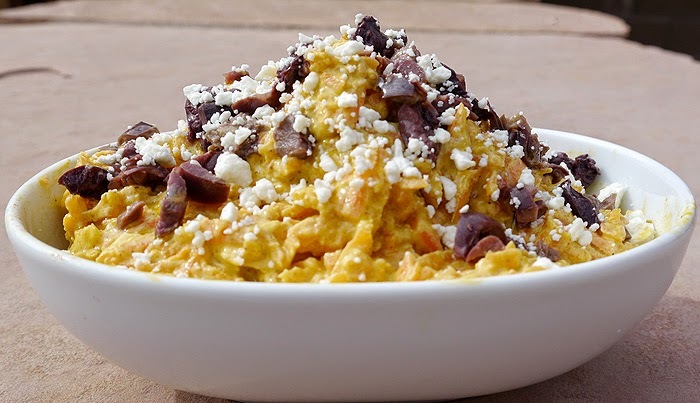 This sounds delish - I'm a carrot addict - including fresh carrot juice (my fav is Columbia Gorge), and I adore Stonyfield Greek - so why not save time and make magic, too, by putting them together in a dip - wow! Great idea! This is such a terrific dip, I love the feta and black olives for added flavors. I'll definitely give this a try. Thanks so much for sharing your recipe.